Clue: “They’re former Air Force officers and third-generation Seattle restaurateurs, occasionally found chasing rainbows at a lakeview-landmark soon to celebrate its 60th birthday. All in the name of good fun — and not a little promotion — they’re celebrating that birthday with a social network-based treasure hunt, kicked off last week, culminating in deeply discounted prices for wily would-be customers.” Who are they? The Ringling Brothers? The Smothers Brothers? The Brothers Karamazov? Errrrrt! Thanks for playing! In the world of restaurant promotions, this one is a doozy — as you’ll know if you’d seen the TV-news coverage last week, showing brothers Mark and Brian Canlis hiding one of 50 signed Canlis menus (circa 1950) at the Seattle Central Library, then sending Twitter followers and Facebook friends hunting for buried treasure: dinner for two at 1950 prices. 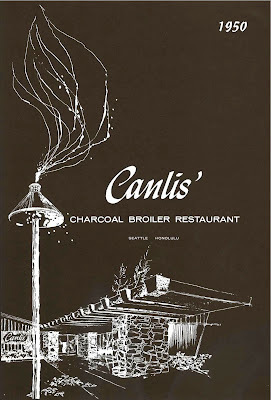 OK, so the library-menu was buried in a Time magazine dated December 11, 1950 (Canlis’ actual “birthday”), but you get the drift. And if you don’t — and you want to participate — see the restaurant website for contest details. There’ve been six clues so far (44 to go! ), and six winners who’ve hit the jackpot by showing up to find menus hidden under the Fremont Troll, in the stacks at Seattle Library, at Gas Works Park, the Blue Moon Tavern, the Space Needle, and early this morning at a local Starbucks. It’s been a kick in the pants to partake in the hunt — except for when it’s not, said Brian Canlis, who cracked up while watching the search at Gas Works Park last week via a telescope in a private dining room at Canlis. “There was a mom in her pajamas and a guy in a business suit” running around with about 40 other people in search of the menu, he recalls. After a congrats from Schultz, Leo said he was surprised he’d won, given that he arrived a full half-hour after the clue went out. (Average find-time has been about 20 minutes.) Apparently, most of his competition had hightailed it to Starbucks’ historic Pike Place Market store first. Leo had been one of the zombies on the march at the Space Needle on Saturday, Brian said, “but he was two minutes too late.” Leo and other winners must redeem their menu before December 11, 2010. That “golden ticket” buys a four-course dinner for two for under $10. 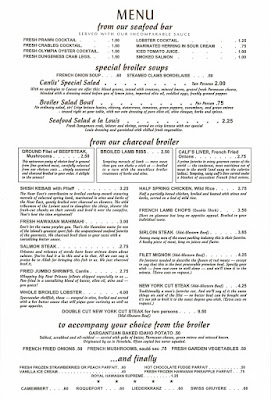 For the record: Sixty years later, it won’t be a cheap date: drinks, valet, and a 20 percent tip — based upon 2010 menu prices — will be added to the bill. Information in this post, originally published earlier today, was corrrected at 3:22 p.m. A previous version of this post incorrectly stated that the Canlis brothers were Naval officers.